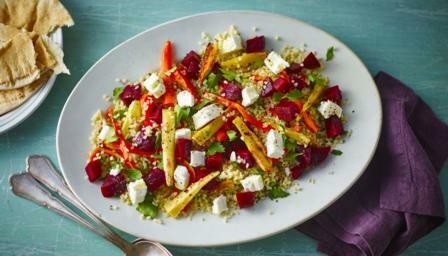 This luxurious salad makes a great light lunch or summer supper for the family. Serve with warm flatbreads. This salad with flatbreads when served as three portions provides 751 kcal, 25g protein, 112g carbohydrate (of which 20g sugars), 23g fat (of which 8g saturates), 10g fibre and 2.2g salt per portion. Preheat the oven to 200C/180C Fan/Gas 6. Line a baking tray or small roasting tin with aluminium foil. Put the parsnips and carrots on the baking tray and drizzle over 1 tablespoon of the oil. Season with salt and pepper and roast for 18-20 minutes. Meanwhile, half-fill a saucepan with water and bring to the boil. Add the bulgur and cook for 6-8 minutes, or until almost tender. Drizzle the roasted vegetables with the honey and sprinkle with the chilli flakes, turning to coat all over. Return to the oven for a further 10 minutes, or until golden-brown and sticky. Drain the bulgur and transfer to a large bowl. Stir in the roasted vegetables. Add the lemon juice and most of the parsley and stir again. Season with salt and pepper. Spoon the bulgur wheat salad onto a serving platter. Sprinkle over the beetroot and goats' cheese. Garnish with the remaining parsley and oil. Serve with flatbreads.